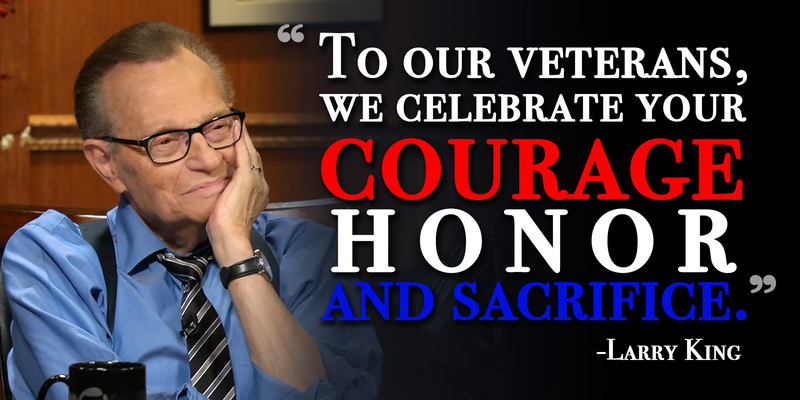 In honor of Veterans Day, Larry King talks to some of our nation's heroes. When I spoke to Larry this morning, I told him I was making a blog with some important interviews about our Veterans. He asked me to add a few words of his own to the blog, you can read Larry's statement below. Following that are some must-see clips in which Larry's guests talk about the issues surrounding Veteran care in our country and the prevalence of PTSD. U.S. Marine Brad Fite shares his inspiring story of survival: the injuries and PTSD that threatened to take everything, and how Brad brought himself back from the brink. PTSD afflicts millions: each day, more veterans’ lives are lost to suicide than those who die in combat. Dr. Norman Rosenthal, Marine Stephen Cochran, and actors Matt Dallas & Steven Grayhm lift the veil on this complex disorder. War veteran Stephen Cochran discusses the need for more media coverage on PTSD-related suicide.